The first time I tasted Maille's mustard with Chablis and black truffles was in Selfridges food hall last Christmas. The flavours were so concentrated and rich that I couldn't stop myself from exclaiming aloud - I really needed my own jar and I wasn't going to share it with anyone. I then saw the premium price tag, put the jar back on the shelf, and resolved to add it to my Christmas list for this year. In a happy turn of events, however, I recently received a gift set from Maille containing a jar of their mustard with white wine, celeriac and black truffle along with a bottle of walnut oil. 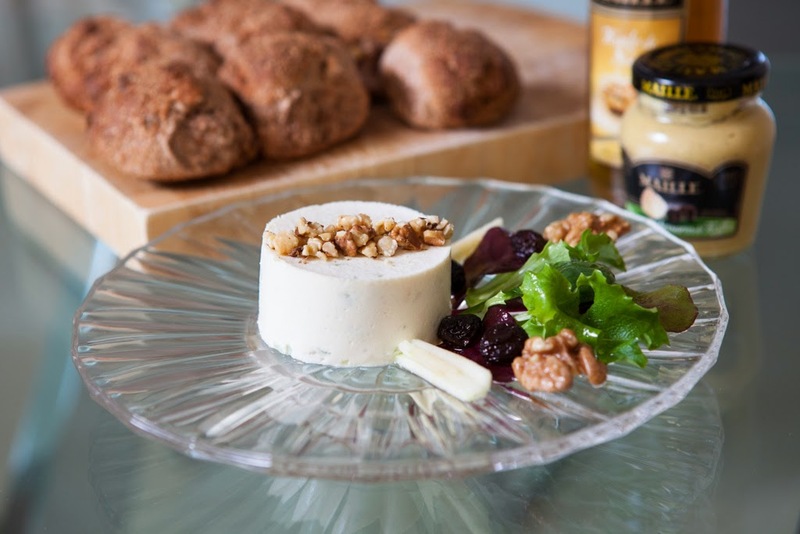 Feeling inspired, I have created this recipe for goat's cheese terrine that showcases these two condiments in a fabulous seasonal starter. Place the raisins in a ramekin and cover with the white wine. Leave to marinade for a minimum of 3 hours. 24 hours is ideal as the raisins become plump and juicy from absorbing the wine. Cut 4 strips of acetate 20 cm in length. Lightly oil them with walnut oil. Line 4 ring moulds (6 cm diameter) with the acetate. Line the base of the ring moulds with cling film. Place the ring moulds on a tray. Remove and discard the rind from the Capricorn goat's cheese. Place the remaining cheese in a food processor and blend into a puree. Add the Greek yogurt and blend again. It should be a smooth puree. Place it in a mixing bowl. Meanwhile, gently heat the whipping cream in a small pan. When the cream is hot (but not boiling), take it off the heat. Remove the gelatine from the water and gently squeeze it to remove the excess liquid. Add the gelatine to the hot whipping cream and stir until it has dissolved. Place the pan over a bowl of iced water and stir continually until the cream has cooled to room temperature. Working quickly, add the cream to the goat's cheese and yogurt mixture and stir thoroughly. Now add the diced celery, diced apple, salt, white pepper and truffle mustard. Stir well and taste the mixture. Add more seasoning or mustard as required. Fill the ring moulds with half of the goats cheese mixture. Place a slice of goats' cheese log in the centre of each ring mould. Fill the ring moulds with the remainder of the goats cheese mixture. Place the ring moulds in the fridge to set. This should take in the region of 2 hours. Whisk together the walnut oil and white wine vinegar. Pre-heat the oven to 180 degrees Centigrade. Place the walnut halves in a single layer on a small baking tray and bake for 5 minutes. Leave to cool. Toss the walnuts, apple batons and salad leaves in the vinaigrette. Drain the raisins from the wine. Arrange the salad leaves on serving plates. Add the apple batons, raisins and a few walnut halves. Gently crush the remaining walnuts into small fragments but not dust. Remove the terrines from the ring moulds and place on the serving plates with the salad. Decorate the terrines with the crushed walnuts. Serve with freshly baked walnut bread.